This outstanding part of the world has long been the first port of call for holidaymakers looking to explore Southeast Asia. 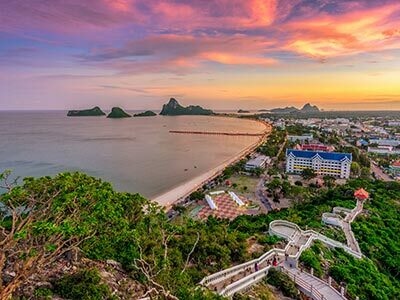 One of Thailand’s main appeals is its incredible diversity and wide choice of destinations, from the bustling surroundings of Bangkok to the luxurious Koh Samui coast. Thailand’s exceptional tourist trade shows no signs of dwindling, either. The country’s reputation for being one of the world’s favourite holiday destinations is no coincidence. A mixture of endearing hospitality and a welcoming atmosphere sees millions flock to this sublime region, year on year. 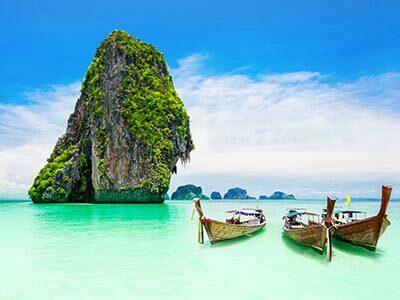 Browse our selection of cheap and discounted 5 star Thailand holidays to discover this exotic destination, and sample the diverse culture that’s a source of inspiration for millions. 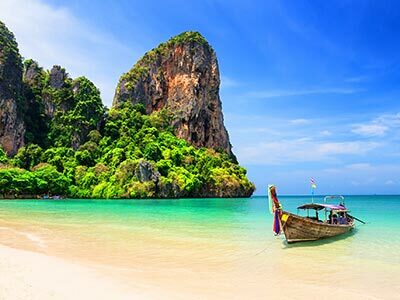 Our cheap luxury escapes will allow you to go on holiday to Thailand in 2019 / 2020 without costing the earth. Flights: You can fly to Bangkok from most major UK airports. However, getting to other destinations in Thailand may include a stop off on the way. Passport/visa requirements: You must hold a valid British passport. This allows you to visit Thailand for less than 30 days without requiring a visa. Packing essentials: Due to Thailand’s tropical climate it is best to pack light clothing. You should also include sunglasses, a sun hat and a light rain mac. If you plan to visit any temples or sacred sites, make sure that you pack clothes which cover your legs and shoulders. 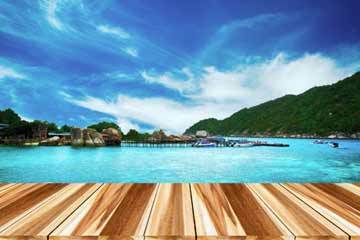 Thailand offers a diverse array of holiday possibilities. Thailand may have a reputation for being one of the party capitals of the world, but there’s so much more to this vibrant country than full moon parties and the raucous nightlife of Patong. You’ll find it’s also a great destination for long haul family holidays, offers plenty of culture for discerning travellers and some of the best beaches in the world for those looking for a relaxing beach break. 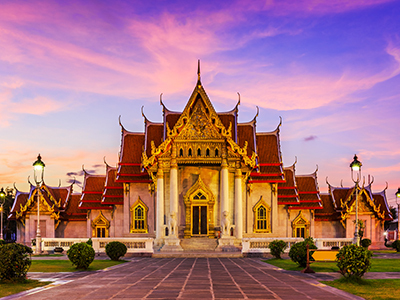 Bangkok, the country’s thriving capital is home to a contrasting mix of luxury shopping complexes and traditional thai markets, future proof skyscrapers and ancient buildings including the Grand Palace and majestic Wat Arun temple. The hustle and bustle of the city isn’t for everybody but offers a rich experience and insight into the history, heritage and culture of Thailand. Located toward the southwest of the country is Phuket. Thailand’s largest island offers a very different experience from the capital. Where Bangkok is an urban metropolis, Phuket is a laid-back paradise, where golden sands meet warm turquoise waters. 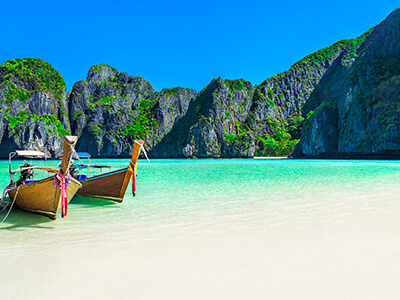 Phuket offers more in the way of a traditional holiday, with beachfront resorts, water sports and theme parks, as well as a host of national parks. Those hoping for a taste of Thailand’s world-famous nightlife must pay a visit to Phuket Town. Koh Samui follows in a similar vein, offering a real luxury holiday in Thailand, with pristine beaches, mountainous rainforests and a plethora of palatial 5-star resorts. The island is situated on the opposite side of the country, just off the east coast. Like Phuket, Koh Samui offers a vibrant mix of leisure activities and brilliant nightlife. Those looking for a secluded retreat, away from all the hustle and bustle, will find it at Khao Lak. The resort, found on Thailand’s west coast, is one of the country’s best-known secrets. This list of wondrous Thai resorts goes on, the quaint fishing village of Hua Hin is where the Thai Royal family built a summer palace and you can understand why they choose to reside here. Impeccable beaches and quieter than the larger resorts like Phuket. Hua Hin offers a truer reflection of Thai life & culture. Krabi with it’s serene beaches, national parks and rainforests is a resort that really encapsulates Thailand’s natural beauty. 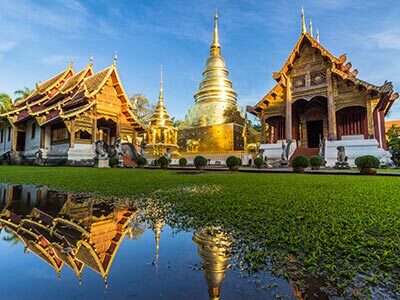 Chiang Mai is a great city destination to enjoy the markets, temples, history and culture of Thailand at a more relaxed pace than in Bangkok and with a more picturesque backdrop of lush green mountains. 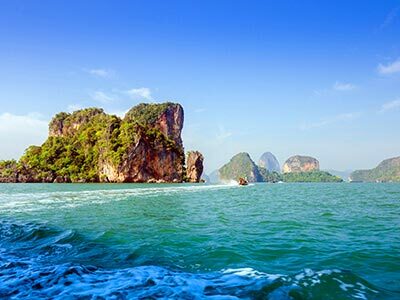 Thailand enjoys a tropical climate, with temperatures ranging between the high twenties and low thirties, all year around. The rainy season is between July to October, however it doesn’t affect the whole of Thailand equally, with some areas experiencing more rainfall than others during this period, so it is wise to plan your Thailand holiday destination according to the time of year you are looking to travel. A journey to one of Southeast Asia’s most beautiful and vibrant locations tempts you. When it comes to cuisine, there are many delicious dishes that you should sample during your time in Thailand. Pad thai is a stir-fried noodle dish flavoured with eggs, tamarind pulp, fish sauce, garlic and red chilli pepper. 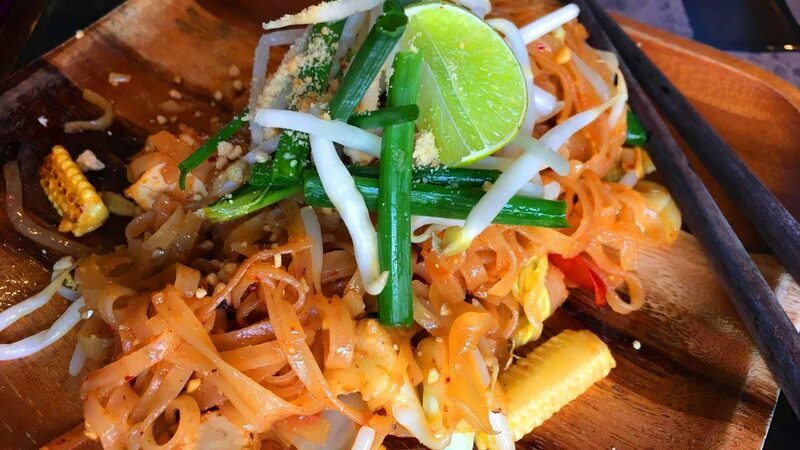 Depending on your taste, you can also enjoy pad thai with a choice of meats or tofu. Another flavoursome dish on the menu in Thailand is tom yum, or tom yam. This hot and sour soup is usually cooked with shrimp and contains a number of herbs and spices. Green curry and red curry are also popular Thai dishes that can be enjoyed during a visit to Thailand. Green curry is made with green chillies and coconut milk, and traditionally fish or meat. Red Curry is created using red spur chillies, garlic and shallots amongst other ingredients, and again a choice of meats. Seafood is also very popular in Thailand, with restaurants and street food vendors serving a wide range of fish in a variety of styles and flavours. Without doubt the easiest way to get around Thailand, and with surprisingly cheap internal flights due to airline competition, it usually works out the most cost effective. Both national and international airlines run multiple flights daily across the country, which will suit all kinds of travellers. Do note that some airlines have significantly different baggage allowances, so it’s worth checking before you fly. Thailand’s railway system is constantly evolving year-on-year, with rail travel offering a safer alternative than coaches and buses. It’s no way near as impressive as some of its European counterparts, or even Japan, but it does offer the chance to get away from most major hubs. Times can be slow, however. As it stands, the railways are government-owned and even run at a heavy loss, so one thing you’re guaranteed is a fair price for your travel. Travelling by rail also offers you the chance to meet new friends or just take the strain away from road travel, whilst simultaneously enjoying the beautiful scenery out the window. Travelling by road (coach/buses) in Thailand gives you the greatest options of destinations and is also extremely cheap. You can opt for more luxury if you deem necessary, but most long bus trips are fully air conditioned. Many journeys can also be done overnight, saving you on a night’s accommodation, although the strain of the bus may leave you bed bound come morning anyway. Short-distance trips can be flagged from anywhere in any city, although some stop at what feels like everywhere, so if you’re in a rush, taxis may be the way to go. You can also hire a tuk-tuk if you only travelling a short journey. These add to the Thai experience and offer a unique view of cities at a fraction of tour prices. Regarding the normal run of the mill taxis, the usual rules apply. Get a price beforehand, try to book in advance with respected companies and you shouldn’t see any problems. In the busier cities like Bangkok, Uber also run a competitive and safe option. A necessity if you want to go island hopping. Ferries can allow you to get to the popular islands like Ko Phi Phi and Koh Samui with relative ease in the peak season. The time and schedule has a lot of variables, but normally the quicker the ferry, the more expensive your ticket will be. Be warned that during monsoon season (May to October) many of the conventional ferries companies operate revised services, with some stopping completely. The biggest festival to take place in Thailand is known as Songkran. Celebrated over three days during the Thai New Year period, from April 13 to 15, Songkran, was traditionally a blessing of splashing water over family and friends. However, this has transformed over the years into huge outdoor festivities. As an increasingly popular time for tourists to visit Thailand, international visitors mix with Thai locals in what resembles a massive water fight on the streets! 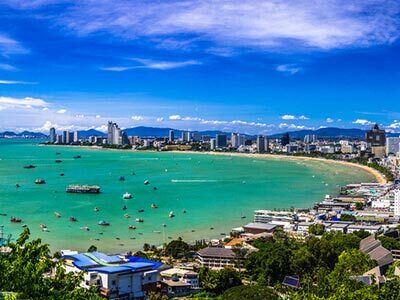 An increasingly popular time for tourists to visit Thailand, international visitors mix with Thai locals in what resembles a massive water fight on the streets! Although not officially a public holiday, Loi Krathong (The Festival of Light) is possibly the most beautiful festival in Thailand. Celebrated in November, the dates are constantly changing due to the Thai lunar calendar. Almost all of Thailand will celebrate this two-day event, with candles laid along river beds to reflect into the water and paper lanterns being released into the sky. Chiang Mai is amongst the most popular places to be during Loi Krathong, but you’ll no doubt only need to look upwards wherever you are to experience this easy-on-the-eye event. Take this the opportunity to wish for happiness and success with your partner – a perfect romantic moment. As night falls, Thailand cities, towns and resorts come alive! Whether it’s late night shopping, dining or all-night partying in the busy entertainment districts, you will never be stuck looking for something to do when the sun goes down. Although night markets are a feature right across the country, the most famous are situated in the capital - the Bangkok Night Markets. Rot Fai market is known for its huge size and hordes of memorabilia and vintage gifts. It moved in 2013 from the north of the city to the east, but this didn’t take away any of the original charm. If you want something with a bit more wow factor to the usual stalls, then ChangChui is perfect for that. Dubbed the ‘plane market’, ChangChui is one of the newest additions to the already busy night market culture, but it has one incredibly cool feature that makes it stand out. Right, slap bang in the middle is a huge aeroplane with stalls underneath and around. The sky really is the limit here. Almost everyone makes a point of visiting some of the country’s best kept temples during the day, but many miss out on revisiting once the sun goes down. Come night time, most are even free to visit, including Wat Arun and Wat Phra Kaew. Other options are to take a river cruise at night to see many temples that are in close proximity, or take a taxi tour around the city to discover the main attractions. Get a different perspective on Thai culture, without the crowds…it certainly won’t be a night wasted. It needs little explanation that Thailand is one of the party capitals of the world.